One of the South Korea’s three major TV station SBS held its 2011 Drama Awards ceremony on December 31st, 2011. It can be said that the SBS’s event beats similar events of other TV stations in term of star-studded. 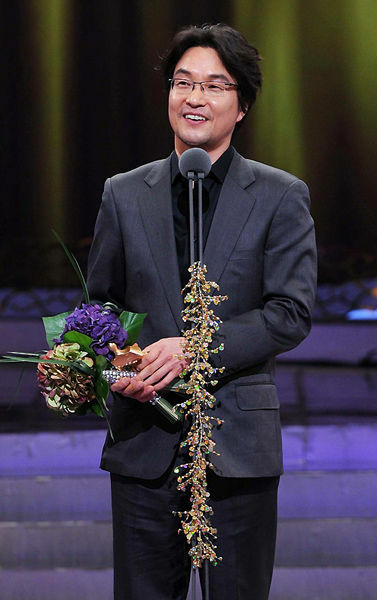 The popular drama series Protect the Boss won eight awards, but the Best Drama Award was won by historical drama Tree with Deep Roots, and the Daesang (Grand Price) award was undoubtedly won by Han Suk Kyu, the actor in leading role in Deep Rooted Tree. Although the quantity of drama produced by SBS in 2011 was not as much as KBS, but it’s matching in term of quality. For example, Protect the Boss, City Hunter, Scent of a Woman, Deep Rooted Tree, Midas, A Thousand Days’ Promise have became the trend of new Korean drama. The ceremony was hosted by couple in Protect the Boss, Choi Kang Hee and Ji Sung. The tacit understanding of them developed during filming of the series allowed them to carry the show without any awkward moment on the stage, and they had also won the highly competitive Best Couple Award. This year, the nominees for best couple award included not only lover couples such as Lee Min Ho and Park Min Young, Jang Hyuk and Lee Min Jung, Kim Rae Won and Soo Ae, Lee Dong Wook and Lee Suna, the male-male couple Han Suk Kyu and Jo Jin Woong was also funnily included, of course, they just brought laughter and did not win the award. Historical drama Deep Rooted Tree was the drama launched strongly by SBS on year end, starring Jang Hyuk, Shin Se Kyung, Han Suk Kyu, Song Joong Ki and etc. Most complete cast members of the TV series attended the awards ceremony, and everyone won their own separate awards, such as Han Suk Kyu the Daesang Award, Jang Hyuk the Top Star Award, Shin Se Kyung the Excellence Award for Drama Special, Song Joong Ki the Producers’ Choice Award, and even the support actress Song Ok Sook won a Special Acting Award for Drama Special. As such Deep Rooted Tree eventually beat other competitors to become the Best Drama of the year. But when comparing with Deep Rooted Tree which won critical acclaim, the popularity of Protect the Boss seems higher, where it won a total of 8 awards. Comparing with stellar guest performances lineup of KBS Drama Awards and cheerless of MBC Drama Awards without any guest performance, SBS cleverly arranged a few actors who won the New Star Award to perform their skills. For example, the performance of Lim Soo Hyang of New Tales of Gisaeng in red dance costume got audience applauded again and again, while Shin Hyun Bin sang a song and etc. And in recent years, the South Korean awards ceremony seems to have a rule that “who comes win the award, absent gets nothing,” but this year SBS could be said as fair. Although Soo Ae of A Thousand Days’ Promise could not attend the ceremony due to personal reason, but she still won the Top Excellence Best Actress Award for Weekend/Daily Drama division, and Goo Ha Ra who was in Japan also won the New Star Award and thanked the ceremony through video recording. On the ceremony, in addition to actors and actresses of major dramas of 2011, SBS also took full advantage of the opportunity to promote the new drama series for the new year. After the countdown, Lee Beom Soo and Jung Ryeo Won of Salaryman, and Ji Jin Hee and Ku Hye Sun of Take Care of Us, Captain went on stage as presenters and promoted the new dramas. Check out the full list of winners for 2011 SBS Drama Awards.